The star of the Halloween Time popcorn world this year is most definitely the Zero Premium Popcorn Bucket. 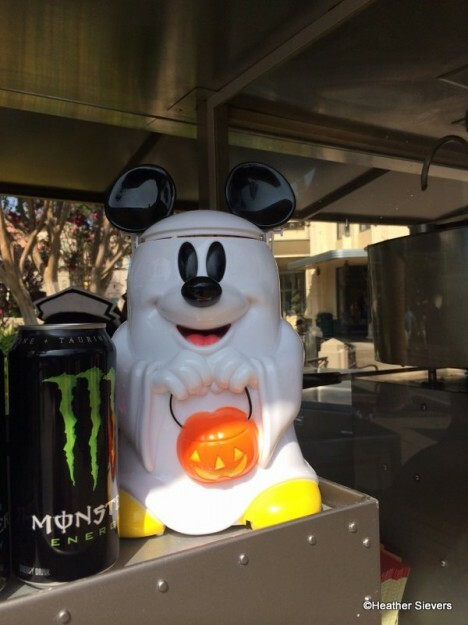 Zero is currently residing in New Orleans Square at the Popcorn Wagon where Oogie Boogie is hard at work! He can be yours for $12.50. To access your freshly popped popcorn, simply open the roof to Zero’s house! When I first saw this adorable little dog house Iknew it had to be mine. 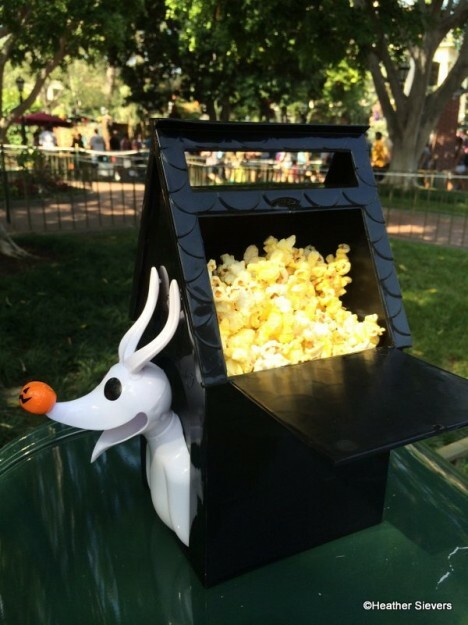 I love using the Nightmare before Christmas popcorn buckets as Halloween decor, and this one tops all past buckets because Zero’s nose lights up! There’s a tiny switch behind the pumpkin nose that allows you to turn it on and off. Check out the video here! 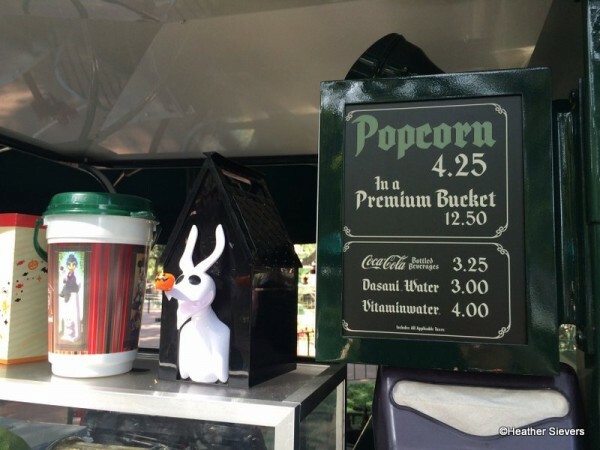 Zero is only available at the New Orleans Square Popcorn Wagon. 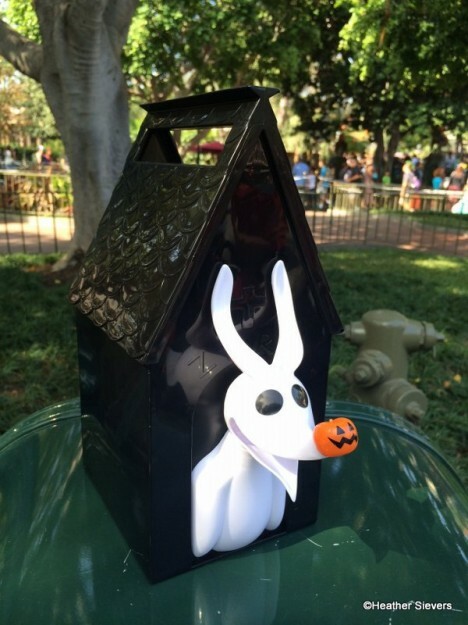 In addition to the Zero bucket, there are a few other Halloween Time themed popcorn buckets around the Disneyland Resort. The Haunted Mansion 45th Anniversary Bucket is $6.25. 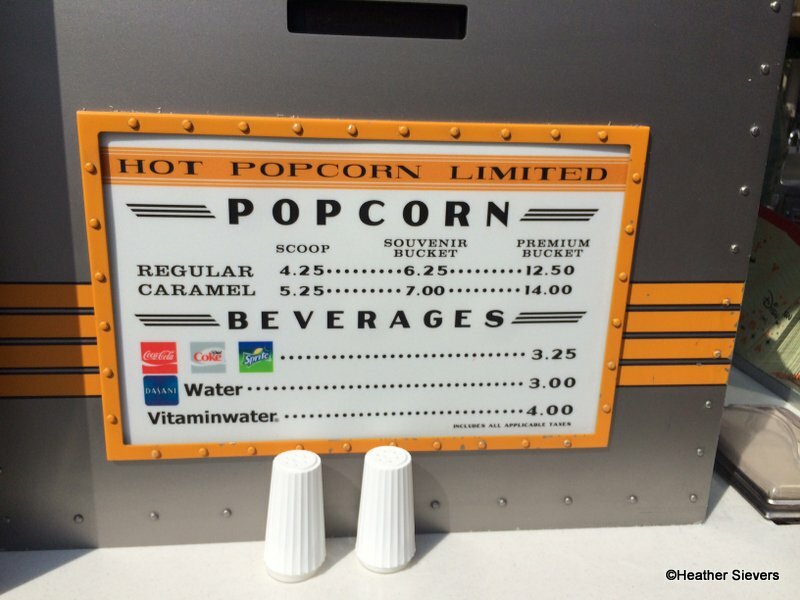 It is also available only at the New Orleans Popcorn Wagon. It features some of your favorite Disney friends as the characters from the Haunted Mansion’s Stretching Room Portraits. You can see it next to Zero in the above photo. There is also a “Skeleton Dance” themed bucket. 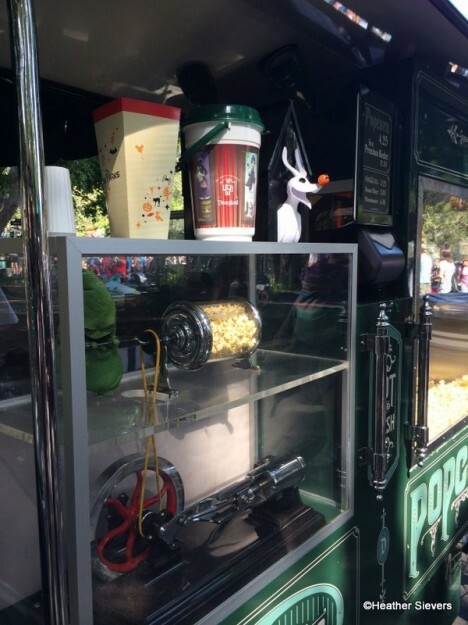 It can be found at select Disneyland & California Adventure Popcorn Wagons as well as in Walt Disney World. I found this one just across the street from Carthay Circle Restaurant. At the same Popcorn Wagon in Disney California Adventure, you can buy this great Mickey Ghost Premium Popcorn Bucket. 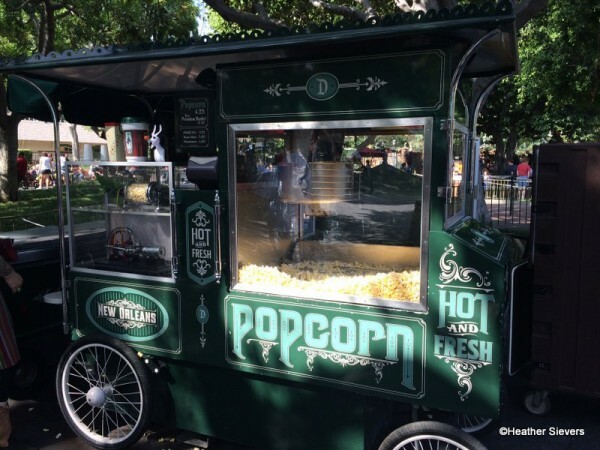 This particular Popcorn Wagon also sells the amazing DCA Caramel Corn, so pricing varies depending on the type of popcorn and/or bucket you’d like to purchase. 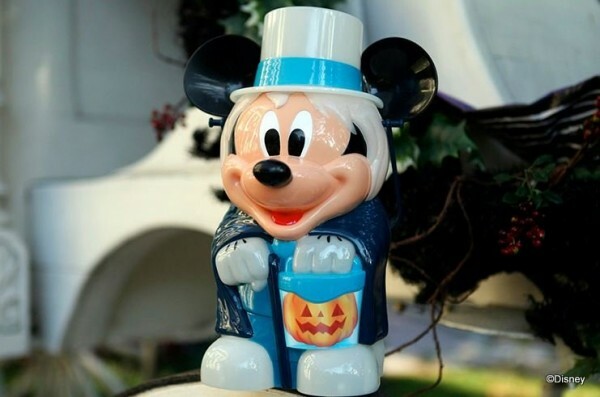 And finally, also in honor of the Haunted Mansion’s 45th Anniversary, Mickey as the Hatbox Ghost. 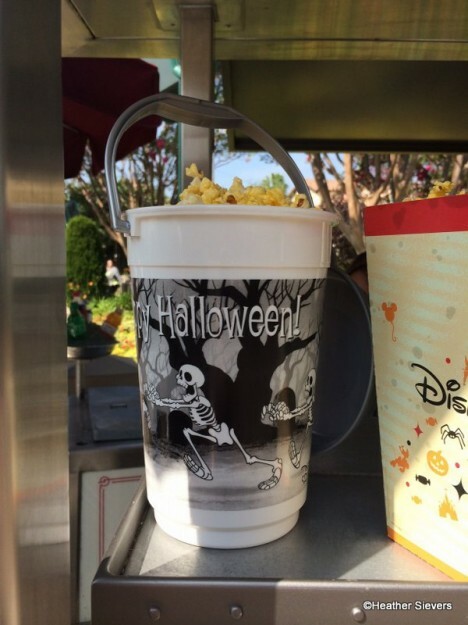 This Premium Popcorn Bucket is $12.50 & it glows in the dark! It’s available at select Disneyland and Disney California Adventure Popcorn Wagons. I caved the moment I saw Zero’s nose light up! and am now the proud owner of that bucket. 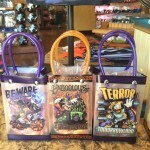 Do you purchase Souvenir Popcorn Buckets? Are you planning on snatching up any of these during this Halloween Time season? Let us know in the comments below. 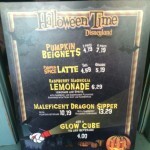 Dining in Disneyland: Fun Halloween Time Candy Bags! I NEED THE ZERO BUCKET , I wonder if you can buy it on line/ Or if some nice person in Cali could send mail it ???? 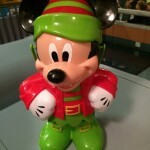 I hope they have a cute Mickey or HM bucket at WDW for 2015, as I would def like to get one when I go next year. Like you said, they make cute Halloween decorations for years to come. That was a fun report. Thanks. @Joni – I think it must be purchased in park. 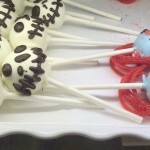 @Essie – How fun that you’ll be there next year for Halloween Time! I’m sure they will have something special! Not going to make it this year since I am headed to WDW, so a friend picked a Zero one up for me! We bought the Zero bucket. The only problem I have with it is that it does not hold much popcorn compared to the other buckets. 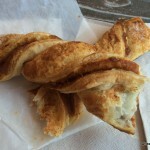 @Galloping Gourmand – I should’ve have given you my popcorn! I actually considered buying mine empty because I didn’t want to have to clean out the popcorn grease. We picked up the Mickey Hatbox Ghost. However, ours looks slightly different! Instead of white/glow-in-the-dark accents, ours is all blue-hued. Also, our cast member asked if we wanted the popcorn on the side. We opted to get it inside the souvenir bucket, but that would be a great option for those of you who want to leave the popcorn grease out of the souvenir! @Lorina – Good to know you can get the popcorn on the side! Odd that it’s not mentioned but I got one of these from Magic Kingdom WDW a few weeks back when we visited from 24th Sept – 1st Oct. there were a number of stalls selling them but I got mine from Tomorrowland. It was a nightmare (no pun intended) to get back to England in my carry on as his nose seems fragile but I managed it and it now sits proudly on my shelf. @Kirsty – Glad it made it home safely! Thanks for letting us know that you found one in WDW. It’s not mentioned here because this post is Disneyland specific. I’m sure readers will be happy to know they can purchase Zero in WDW too! Since I’m not going to Disneyland until December and I wanted the Zero bucket so bad that I found it on Ebay. And I heard the line at that Popcorn Wagon was at least an hour long!! @Janine – I think it depends on when you go. I went on the weekend and the line looked to be about an hour long. But then I came back on a weekday morning and walked right up. 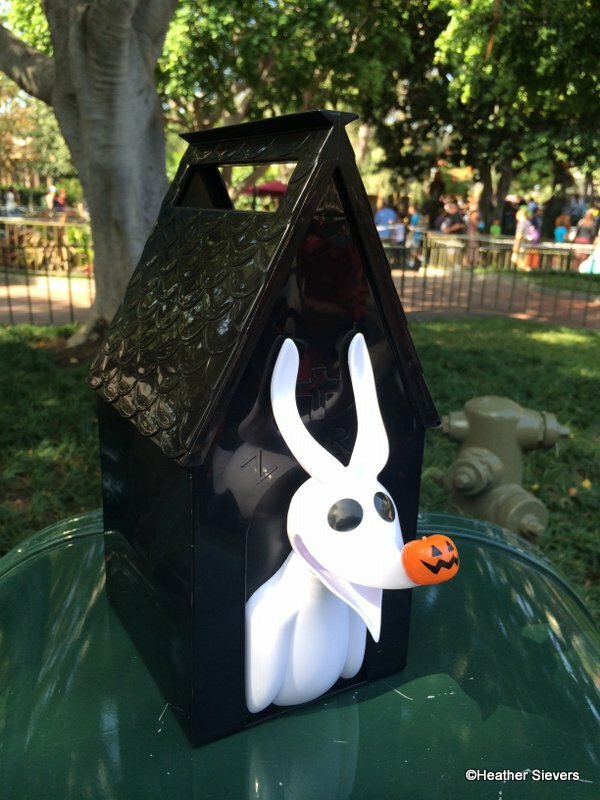 Is the Zero popcorn bucket only available during Halloween or through the holiday season (or while supplies last) while Haunted Mansion is transformed to Nightmare Before Christmas? @April – I believe it’s through the holiday season. Could the zero bucket be purchased online? I would love to buy one if it can be. Hello, I would like to know if you have the Zero bucket, we have been looking everywhere, can you help? Darla, since they have different premium popcorn buckets from year to year, that will probably be a difficult object to find. Good luck!